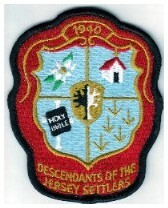 The crest was adopted in April 1989, at the 50th reunion of The Descendants of the Jersey Settlers. At the time, the Executive Vice-President of the organization was the Principal of a school in Louisiana. She asked the art teacher of her school to produce the design. At the top of the emblem is the date of the organization’s founding, with the name of the organization at the bottom. The scroll work is divided into four quadrants, centered by a small shield bearing a family tree, half in darkness and half in light, representing the dead and the living. In the upper left quadrant is a magnolia blossom, the State Tree of Mississippi. In the upper right quadrant is a church and in the lower left quadrant is a Christian Cross and a Holy Bible, symbols of the strong religious faith of the Founders. In the lower right quadrant are wheat shafts to represent the Settlers’ occupation as yeoman farmers. The first meeting of the DJS was held Sunday, April 1, 1940, at the old Kingston United Methodist Church. Henry Blackburn Eaton of Wood River, Illinois, instigated the meeting, contacting his cousin, Daniel S. Farrar of Lake Village, Arkansas, to assist him in rounding up all known descendants of the Jersey Settlers in the area to notify them of the meeting. A small but representative group of forty-eight descendants along with a number of guests were on hand for the founding meeting. The name selected for the group was The King, Swayze, Farrar, Eaton Family Association. This founding meeting resolved to perpetuate the association, including the election of officers. Mr. Blackburn was nominated for president but declined, stating his opinion that the president should be someone more local to Adams County. Mr. Farrar was then unanimously elected president, serving that office from 1940 through 1964. Mr. Eaton was elected secretary, along with Mr. E. E. King of St. Louis, treasurer, and Mrs. Bessie V. Netterville of Newellton, Louisiana, vice president. At the second annual meeting, billed the "Reunion of the King-Swayze-Farrar-Eaton Family Association," Mr. Eaton outlined his plan to write a book detailing the history of the families. For the next decade until his death, Mr. Eaton conducted extensive research and collected family data. His book, The Descendants of the Jersey Settlers, was published posthumously by his family in paperback, and became the basic genealogical reference for the organization until publication of Volumes I and II. Data from the book has been accepted by the Order of the First Families of Mississippi and the Colonial Dames of the XVII Century. This book was the inspiration as well as the foundation for the organization's United States bicentennial project, the writing and publishing of The History of the Descendants of the Jersey Settlers of Adams County, Mississippi, Volumes I & II. To meet annually to renew the ties of known descendants, to welcome newly discovered descendants, and to teach the younger descendants of their noble heritage. Early on, the tradition of never levying dues or fees for membership was established. The organization has always supported itself by voluntary contributions and donations from its membership. In 1977, the United States Internal Revenue Service officially recognized the organization as a non-profit, tax-free entity, in the process naming the organization "The Descendants of the Jersey Settlers, Adams County, Mississippi," the ex officio name until formally adopted with its constitution in 1987. Also in 1977, The Hereditary Register of the United States of America officially recognized the organization as a lineage organization. As the organization has grown, so has the structure of the organization. Today, the DJS has nine officers, three Cemetery Trustees, and numerous committees. The annual meeting has grown from a simple meeting at the church followed by lunch on the grounds to a three-day affair in Natchez with almost constant activities. There are now some 1,500 members throughout North America and much of the world. Recognizing the need for a written Constitution, the organization appointed a constitution committee in 1986, consisting of Frances Preston Mills, Annis Bell Laird, and Roland Dudley Marble. On April 26, 1987, the organization in General Assembly adopted the Constitution and By-Laws of the Descendants of the Jersey Settlers of Adams County, Mississippi, memorializing the concepts of our founders and prescribing the course for generations to come.